Capture all of the romance and elegance of midnight moonlight with this stunning bouquet of premium white flowers beautifully arranged into a graceful arc. 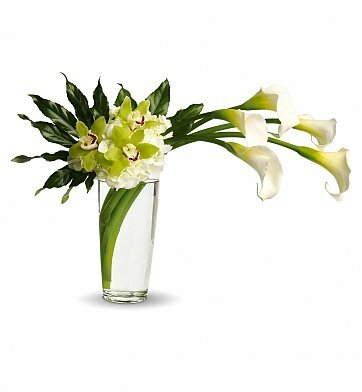 Gorgeous callas, white hydrangea, and exotic orchids fill a tall glass vase to create a green and white dream. No matter who you send this fabulous arrangement to, you can be sure it will impress! Measures approximately 29" x 20". Modern Moondance Bouquet is a hand delivered gift. These gifts are delivered by one of our local design centers located throughout the United States and Canada. Same day delivery is available for most gifts when ordered before the cutoff time. The cutoff time for Modern Moondance Bouquet is 2 PM in the recipient's time zone.